It’s finally here! The 2018 season kicks off tomorrow and we are ready to rock and roll! Today, we preview our own Northwestern Wildcats and look ahead to Week 1 as we head to West Lafayette to take on Purdue. We are your premier Northwestern Sports Podcast! You can download the episode from iTunes or directly from here. After a long offseason of speculation and preview, the 2017 College Football season is finally here. We preview Northwestern’s game against Nevada and look around the rest of the CFB landscape. We are your premier Northwestern Sports Podcast! You can download the episode from iTunes, Stitcher Radio or directly from here. Our picks are in for our 2017 picks contest. What a wonderful start to the season! We look back at Northwestern’s big win over Stanford and break down the rest of the Week 1 action before looking ahead to Week 2. We are your premier Northwestern Sports Podcast! You can download the episode from iTunes, Stitcher Radio or directly from here. Cat fans, it’s time to dust ourselves off and get back up for the next round of the fight. Last year was plain awful to go through as a fan; but if you squint (and you don’t need to squint very hard), that 5-7 record turns into 7-5 or even 8-4 very very quickly. Note that NU achieved that record with the Marknado missing, 2 injured quarterbacks, and some really bad play-calling tendencies. Well, one of those things won’t be fixed in 2014… one will pretty much be up to the football gods, and the o-line to some degree… but the last really should improve this year for a litany of reasons (check out our most recent podcast for the details). The Scuzz model sees NU as a middle of the road team this year, and that is without any impact from our expectations around play-calling and offensive rhythm. 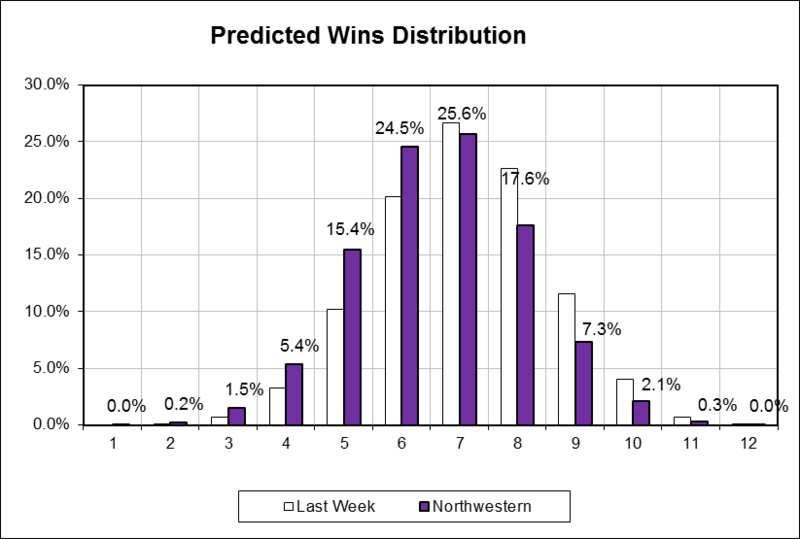 There are some pretty low expectations out there for NU, but this model sees the Cats as a 6 or 7 win squad, even with the big losses on offense. “Last Week” below is truly the projection from a couple weeks back, before adjusting for the losses of Venric, Christian Jones, and Sean McEvilly. Overall, their loss is worth a decrease of about 0.5 expected wins. Contrast that to Braxton Miller departure which bleeds OSU of 2.5 expected wins. How is that possible you ask? Well the fact is, that NU’s numbers last year were reasonably good, even without Mark. Again, they were 3 plays from being 8-4! And, they did that with an offensive efficiency (unadjusted) that was well below the NCAA average, and was 30% below NU’s stats in 2012. 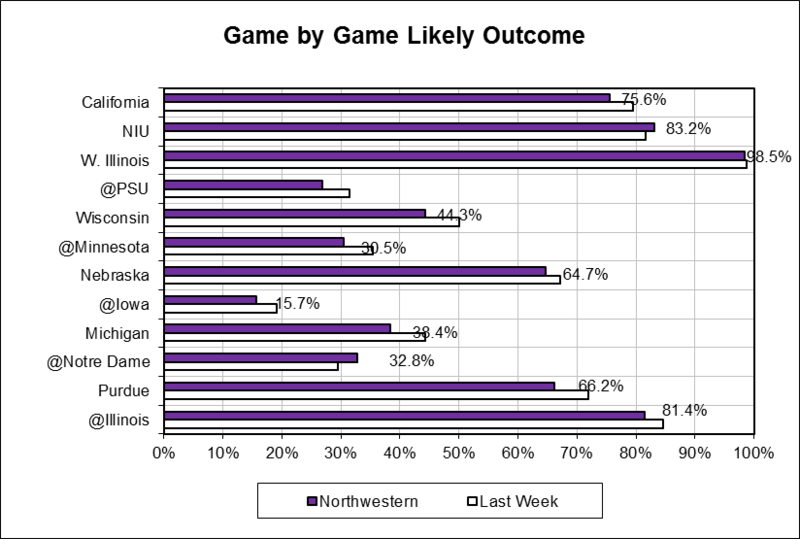 I realize that sounds overly optimistic, and maybe stats are for losers, but these stats think NU will be bowling and should the other two things that killed the Cats last year get fixed (QB health & play calling), we should see some seriously improved offensive efficiency and that give NU a chance to make some legitimate noise in the West. In fact, if NU’s offensive efficiency gets back to 2012 levels (approx 7 addl pts per game), the model pegs the Cats at 9-3 on the year. P.S. the thing you should take away from above, is that neither Wisconsin nor Nebraska are looking as strong as many outlets believe them to be… particularly Nebraska, who I think is due for a bad year…. That said, even if NU does have a big jump up this year, we will have a tough time beating out Iowa for the division crown given their insanely favorable schedule. Last year ended up being the best year for the Scuzz Model yet, and a solid year for the weekly blog picks as well. We’re back at it this year. Note the record for the blog picks is based on my 5 “games of the week”, which I choose based on how my predictions vary from the published lines and the general status of each team. There are occasions where I can’t find a 5th game that I feel comfortable about, but I always include some extra picks based on the model that I think look reasonable, or are just interesting to me (i.e. Big Ten games). Rice (+21) @ Notre Dame: So many things with this game. ND’s disarray, Golsen layoff, inflated ND lines, and then there’s last year’s opener, when Rice made Texas A&M look bad. With all the turnover on ND’s defense, particularly the loss of their entire D-line, Rice should be able to run and stay in this. The model favors the Irish by only 13. Bowling Green (-7.5) @ W. Kentucky: BGU was an incredible team last year, particularly in their run game and defense. They may drop off a little having lost some defenders, but the Hilltoppers lose a lot more, including their coach. I like BGU to really roll in this game – the model favors them by 33. Washington State (-8) vs Rutgers: If teams are getting lines like this against Rutgers, it’s gonna be a fun year. We’re all waiting for Wazzou to really put the Mike Leach offense together, and I think at the very least they continue to progress in ‘14. Rutgers, as we’ve discussed on the podcast, is in trouble this year on defense. The Scuzz Model favors WSU by 19. Florida State (-17.5) vs OSU: This one seems pretty straight-forward. OSU lost just about everyone, and FSU is the presumptive #1 team in the country. Great stat from Phil Steele – OSU lost 32 lettermen, and only returns 38… that is crazy, plus then the hype and pressure of the opening game in Jerry World against the defending champs. The biggest thing I noticed about Winston and FSU last year, was their ability to show up in big games and in the spotlight. This game checks those boxes… I think the model is spot on favoring the Seminoles by 32. Auburn (-20.5) vs Arkansas: So apparently they are excited for year 2 of Bret Bielema in Arkansas. I can’t imagine why. Last year, the Razorbacks were decimated by everyone with a pulse and lost to Rutgers as well. They fell to Auburn by 18, and this year have to travel to Jordan-Hare to face an Auburn team that returns most of its big dogs, plus is entering year 2 with Malzahn at the helm. Many expect Auburn to drop off this year in wins, and I am no different… that’s based on how many close calls they had last year… a 35-17 bruising of Arkansas does not fall into that category, and both the model and I expect the Tigers to destroy Arkansas as a way to set the stage going into this season. Scuzz model favors Auburn by 31. 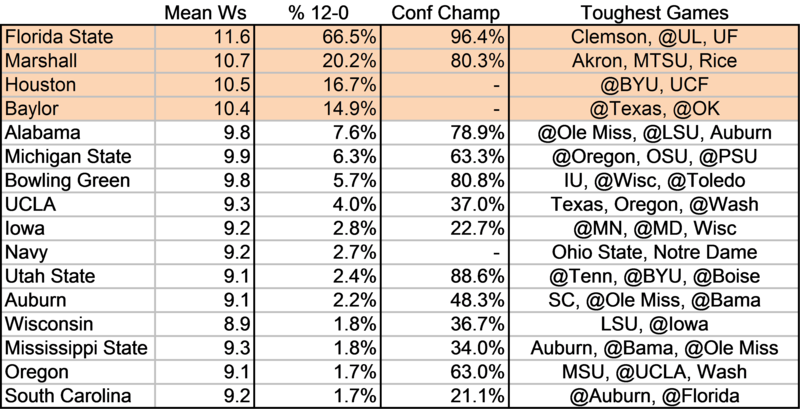 North Texas (+25.5) @ Texas: I’m not comfortable making this an official pick, just cause Charlie Strong is an X-factor, and may impact a huge jump for Texas if he can get his players to play at potential (like he’s done everywhere else he’s coached). Strong’s impact may take time, however, and UT has been disappointing for a few seasons now while N. Texas looks to have a strong squad here. The Longhorns will win this game, but I like to think Mean Green pride keeps the score close. The model says NT can keep it within 3 TDs. Utah State (+6) @ Tennessee: I can’t really pick this, cause the model sees it as a push, but I love Utah State in this game. Chuckie Keeton is back for this Aggie team that almost upset USC last year and Wisconsin & Auburn in the years before that. I think they finally reel in a big fish … the Vols have some good skill players, but have complete turnover on both lines. The BCS is dead, gone, and long forgotten. The crystal football has been replaced by a steel football-shaped tube (at least on one end), and while the Florida State Seminoles reign supreme for now, their path to a repeat is much more difficult this year in having to go through 2 of the top 4 teams in CFB to win it all (although the ACC looks less daunting this season). Despite the long years of the BCS telling us otherwise, going undefeated remains an important and impressive achievement, and coincidentally is the best way to book your ticket to a Playoff spot. Looking at the landscape laid out by the Scuzz model below, the teams with the best shot of making the playoff are FSU, Bama, Baylor, and Michigan State. Will you look at that though? One of these pesky non-Power-Five schools may have the audacity to go undefeated in the first year of the Playoff, and make everyone lose their marbles! No doubt Marshall’s 2014 Thundering Herd is a stacked football team, but unfortunately their schedule is just the opposite… Phil Steele ranks it #125 in all of CFB (Houston plays somewhat more interesting competition as part of the Big East (AAC), but I have much less faith in them staying un-blemished, especially having to visit BYU). The 125th ranked schedule is bad, and it means that Marshall have no prayer of making the playoff over even 1-loss power-5 squads (unless Condi did a Randy-Moss-like-stint at Marshall and nobody knows about it). Now, if four 1-loss teams get in ahead of Marshall, you can bet that legislators from the great state of West Virginia will get up in arms (just like the senators from Utah & Idaho that have preceded them in CFB purgatory), and join the chorus of voices that will surely be demanding an 8-team playoff with one guaranteed non-power-5 spot. I bet you by 2018 we’ll have that format (or at least an NFL-style 6 team playoff), lest CFB risk its anti-trust status; who knows, between O’Bannon, Kesler, and CAPA, that ship may sail much sooner. Regardless, it will be fun to see who can make this playoff in year one, and participate in one of the greatest money-making moments in college football history…. The games should be pretty damn fun as well. After a very interesting opening week in Berkeley, the West Lot Pirates break down the NU victory over Cal and look ahead to this weekend’s game against Syracuse. We are your premier Northwestern Sports Podcast! You can download the episode from iTunes or directly from here. Be sure to head over to northwesternhighlights.com for his amazing game recap, and be sure to check out Glopknar’s Top Gun tribute on sippinonpurple.com. Also be sure to check out our Facebook page! Head over to Facebook and “Like” us there for all the latest updates. You can also follow us on Twitter and join the conversation!